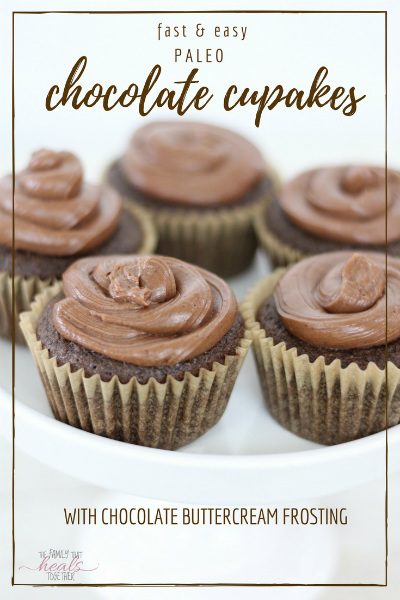 With recipes for cake and cookies a regular around here, it should come as no surprise that I’m a fan of a good paleo treat, which is why I can’t believe I’ve never shared these super easy paleo cupcakes with you before. 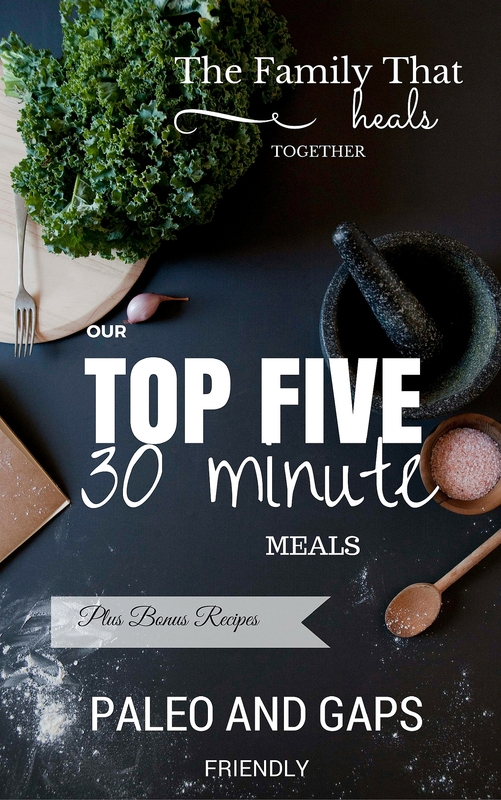 You’ll find the fast and simple recipe below. Even though I recently revealed that our family hasn’t stuck with a strict paleo diet for quite some time now, a lot of the foods we still eat are paleo or primal. We still eat grain-free the majority of the time, and gluten-free always. 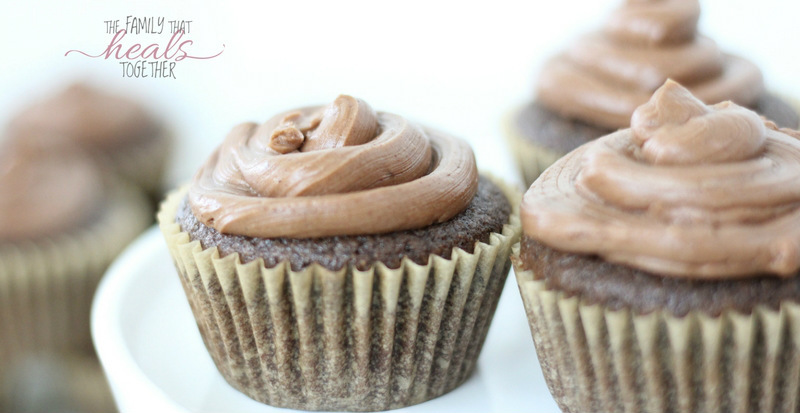 That’s why I’m still using some of the staples I developed early into our paleo eating journey, like these paleo cupcakes. I turn back to them over and over for birthdays, playdates, or just an occasional special treat for my boys. I’m a firm believer that if you ARE going to put a child on a strict diet, you had better get good at making alternative treats! It never fails that no matter where we go, whether it be church, homeschool co-op, or sports activities, there is always food. I learned pretty quickly that I had better come up with alternatives that my boys could still enjoy on a strict diet. Last week, when a sweet friend invited us for an impromptu, last-minute birthday get together, I quickly scrambled to throw together something we could have. 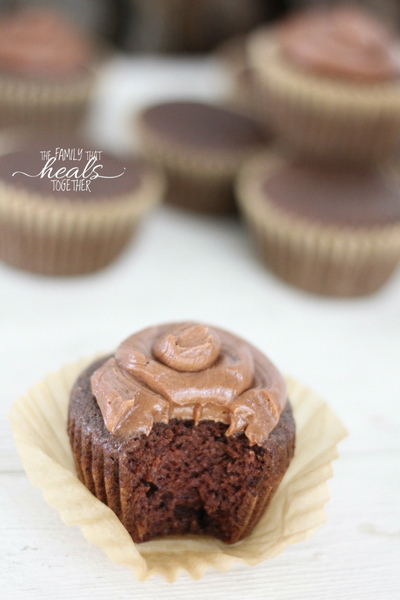 These paleo cupcakes fit the bill. In the past, I’ve declined invitations because the stress of being around junk food can be hard to handle. Thankfully, my new friend has healthy habits too, so I wasn’t too worried about a plethora of junk. Besides, after being cooped up for days on end thanks to Hurricane Harvey, I wasn’t turning down an invitation to get out of our house and socialize. Thankfully, for our family, it’s back to business as usual here, about 9 days after Harvey initially hit. I know lots of other families have not been so fortunate and we continue to pray for them and look for ways to help. I hope you’ll do the same! In a separate bowl, whisk eggs, avocado oil, maple syrup, and vanilla together. Add wet ingredients to dry ingredients and whisk until mixed well and lumps are gone. Scoop a heaping 1/4 cup into each cavity. Bake for 20-25 minutes, until middles are springy but cooked through (check with a toothpick). Using a hand mixer, beat butter on high for about 30 seconds. Add remaining ingredients and beat until smooth, scraping sides as necessary. 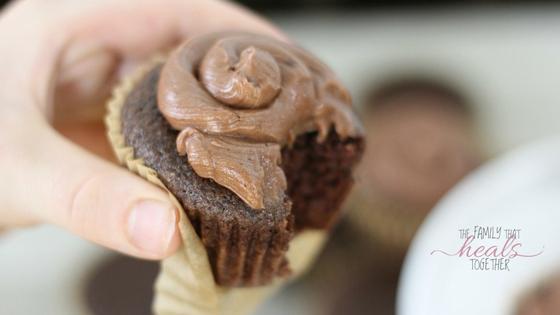 Frost cooled cupcakes using a piping bag or by spreading with a knife. I still remember when I first at one of your healthy chocolate 2 layered cake for the first time Jaclyn… it was to die for! I am making these this weekend! I miss your family in coop!!! Hope you are all doing well!! Can you use coconut oil in place of avocado oil? Yes; just melt it first! 🙂 Enjoy! Hi there. My kids have been struggling with digestive issues, headaches and low attention/high emotion. We just started an elimination diet as a family for 6 weeks before reintroducing. Of course, my daughter’s 10th birthday is smack in the middle! I am trying desperately to find a frosting that will hold up at room temp so we can make a cake she (and her guests!) will enjoy. Do you think this will work? Yes; this frosting holds up at room temperature. Hope you love them and that your kiddos start feeling better as you make changes!